When evaluating the strength of an argument, students are often told to examine the supporting details. The challenge with this directive is that many students are unclear what supporting details really look like. This chart serves as a visual to help students see six specific ways that an author might use to support an argument. This helps students to hone in and look for specific elements within text. I used 6 x 8 sticky notes to write the different words on. I like writing on the red sticky notes to represent bricks. Make the connection that these are like the bricks in a house. 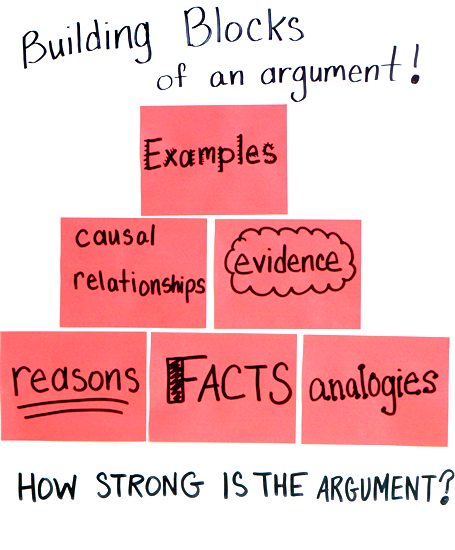 These different things help to build the foundation for an argument. Students should be able to use this same concept when they discuss a text. How strong is the argument? What types of support does the author have to develop his or her ideas? Students can quantify what they are reading and classify it using the blocks. 1. If you have a cinderblock wall in your classroom consider skipping the chart paper altogether. Use the actual wall to create a wall anchor chart using the sticky notes alone. 2. Create a checklist for older students. List each of the six areas and ask them to simply check off what the author used in the text. 3. Extend the checklist activity and ask students to look for different types of support that they notice in a text. Students can craft an informational writing piece about the reading. What do you do to help your students think about evidence and support? It is always a breath of fresh air to see smart, educated, people of color pushing for real change in education. Thank you for giving some of the students in class, especially the girls, a role model, and great lessons. In the midst of all the district changes; I am pushing for savvy use of technology in my room, certainly, and my school, hopefully. Many teachers are interested, but you know. What are some suggestions you can give me to get more people on board? I am using a tablet, the kids, their new chromebooks. I want to include your blog. Googleclassroom or mybigcampus and maybe a website. Thank you for your time. I have not been checking my comments much this year. I apologize! I hope things are going well. Yes, you can use my blog in anyway that helps teachers and students! I have taught in Korea for 12 years and last year, I started teaching in US. Everything was new and different from Korean education. I spent a lot of time studying and planning to teach well. Your book is so great. It helped me plan better and convey knowledge better. I really appreciate your effort. I love your books. i just purchased Chart Sense and Informational Text Lessons. I have one question. Can you explain casual relationships (Reading Standard 8)? I must have missed your comment this summer. Causal relationships are cause and effect relationships. One event, individual, or idea has an impact on another. For example, Adolf Hitler has a causal relationship to the Holocaust. His actions made many of those events occur. Civil Rights activists would have a causal relationship to social justice changes, etc.